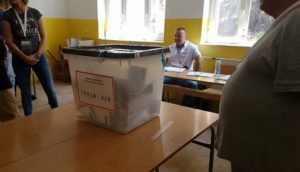 A day after the Kosovo President ordered elections in the four Serb-majority municipalities in the north of Kosovo, the Kosovo Serb political parties still do not have a clear answer whether their candidates will be running in the upcoming elections. 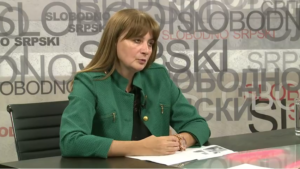 „We find this decision and the time it was put forward a little strange,“ the president of the GI SDP and a councilor in the North Mitrovica MA, Ksenija Bozovic said, recalling that only four days remain until the deadline set by Serbian President Aleksandar Vucic, who asked Srpska Lista to wait for 45 days before leaving Kosovo institutions. Bozovic also recalled that the mayors initially resigned because of the taxes imposed by Pristina, which were not abolished in the meantime, while elections were called. „The SDP is fully monitoring the situation, we will hold a meeting with our members. We will thoroughly review the situation. We will see how people think and we will talk to the citizens because this is something new for them as well,“ she told KoSSev. „As a political option in Kosovo, we will wait for President Vucic to call and talk to us. Since Srpska Lista is meeting with the President in Belgrade tomorrow, we expect the President to invite us and to talk to us so that we can evaluate the situation together and do what is best for the Serb community in Kosovo,“ she emphasized. „We should all think about this and show that we are united and that we are working in the interest of the Serbian community in Kosovo in this difficult period when some very important and difficult decisions should be reached,“ the president of GI SDP underlined. Bozovic also pointed out that only elections for the mayoral positions have been announced and not for local assemblies. She recalled that under the Kosovo laws the local assembly is obliged to convene a minimum of one session in the first six months of the current year and that municipal assemblies in the north will be dissolved if they do not hold at least one session by June 1st. The leader of GI „For Our Zvecan“, Dragisa Milovic also believes that the reasons why the mayors initially resigned have not been resolved. „The mayors resigned due to the introduction of the 100% tax increase on goods from Serbia and Bosnia and Herzegovina and because the instigators and the murderers of Oliver Ivanovic were not found. As far as we can tell, both reasons behind their resignations have not been resolved and I do not see why we should participate in these elections,“ Milovic told KoSSev. He agreed with Bozovic’s claims that other political options should be involved in the consultation process in Belgrade. „The representatives of Srpska Lista were invited to come tomorrow, and I think that there was room for the others. The representatives of Srpska Lista are not the only ones living in Kosovo, there are other political structures, civil initiatives, but we will see. We will wait for the official position of the government and the President of the state, Mr. Vucic, and then we will make a decision,“ Milovic said. „Remember the pre-election campaigns when cars belonging to political opponents were set on fire, when we had so much bad blood among us that I would not want anyone to participate under such conditions,“ he emphasized. Milovic shared his belief that this new situation is an opportunity to bring back the local municipal assemblies within the Serbian system and to call elections under the laws of the Republic of Serbia. Vice-President of Srpska Lista and a deputy in the Kosovo Assembly, Igor Simic told RTS this morning that Srpska Lista will act in agreement with the Serbian government and President, and that its position will be officially announced after tomorrow’s consultations with the President. „Srpska Lista will always, as it has done so far, accomplish two things: consultations with official Belgrade and absolute respect for the interests of our people,“ Simic emphasized. He said that he „does not want to waste words“ on other Kosovo Serb political representatives. 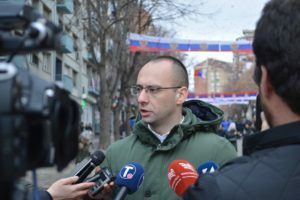 „We will talk to President Vucic in Belgrade tomorrow and they will talk to those who absolutely do not represent Serbs in Kosovo, who received less than 5% of votes here. 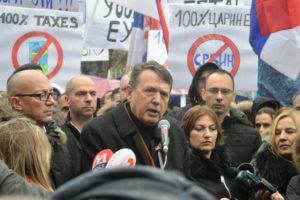 Those people from Savski Venac and those millionaires and everyone else are awaiting Srpska Lista’s decision on this issue, not so that they will make their decision, but in order to attack the decision of Srpska Lista,“ Simic said, adding that “attacks” of other political representatives from Kosovo are inevitable, regardless of which decision Srpska Lista reaches. „If we decide not to participate in these elections, they will attack us, claiming that we do not want to take responsibility. If we choose to participate in the elections, they will also attack us,“ Simic claimed. „This is just another provocation by Pristina, from which the Serbian people, as in all previous cases, will come out stronger and more united,“ he added. „We have different ideas, but we will be able to officially present them only after consultations,“ Simic concluded.